Florida Farm Bureau received the 2016 Pinnacle Award for outstanding member programs and achievement in 2016. The Pinnacle Award was presented by the American Farm Bureau Federation at its 2017 Annual Convention in Phoenix on Jan. 8. 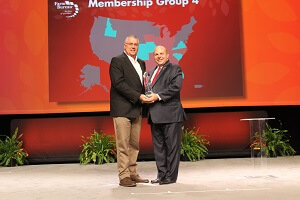 This is the third time Florida Farm Bureau has received the Pinnacle Award in five years. The state organization also received the Awards of Excellence for outstanding achievements in six program areas and the President’s Award for achieving membership quota and demonstrating superiority in three Awards of Excellence categories.